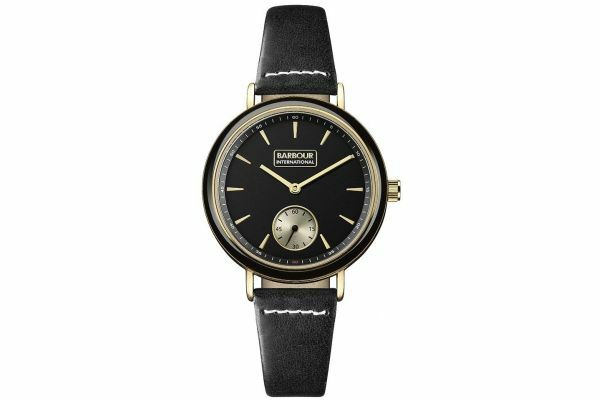 This lovely petite ladies watch from Barbour is part of the Dovedale collection and is perfect for casual day wear. The black leather strap and black dial are the perfect background for PVD plated gold highlights through the case and dial. The subdial featured at the 6 o'clock position houses a second hand while the Barbour International logo sits a proudly at the 12 o'clock position. This watch is perfect for accuracy as it is fitted with a reliable quartz movement and is protected by a 2 year Barbour guarantee. For us to size your new Barbour Dovedale watch as accurately as possible, please take a look at our downloadable Watch Sizing Guide.